OnePlus One was launched in India about 10 weeks back, and has garnered good response with their partnership with Amazon India. OnePlus One, often abbreviated as OPO, is one of the best smartphones available in the market at the price point it sells at - but only if it were available in the market. The OnePlus team hasn't exactly been able to cash in on the demand of the phone because of their invite system. Even with the OnePlus One invite system, which makes it quite difficult for someone to be able to buy the smartphone, the OnePlus has sold in good numbers. In order to further substantiate those numbers, OnePlus has announced that it will hold an open sale of the OnePlus One, in which everyone wishing to buy the smartphone will be able to do so without needing to get an invite from someone. 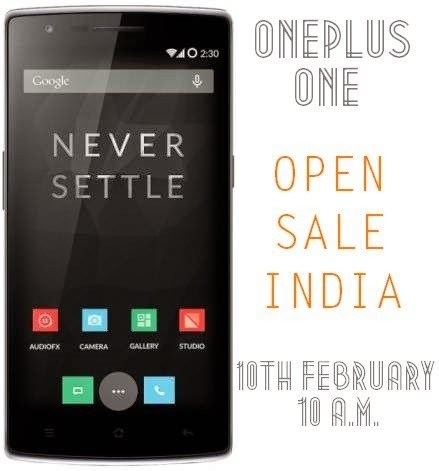 While this is going to be a one-time event in India right now, internationally, users will be able to buy the OnePlus One every Tuesday without needing an invite. When this "open sale every Tuesday" sales system comes to India can't be said right now. So if you are planning to buy an OnePlus One, make sure you get one tomorrow itself. Buy OnePlus One from Amazon India here. Interestingly enough, tomorrow i.e. the 10th of the February is going to be the launch day for the Xiaomi Mi4, which has nearly the same specifications at nearly the same price point. So, this open sale move can be seen as a ploy by the OnePlus team to divert buyers' attention from the Xiaomi Mi4 by giving them an opportunity to buy the OnePlus One without any hassles for getting an invite to buy one. Moving from how to buy the phone, to how the phone itself is - the OnePlus isn't called Flagship Killer without any reasons. The phone packs a Snapdragon 801 chipset, 5.5 inch Full HD screen, 64 GB internal memory with 3 GB RAM, 13 MP primary camera with 4K video recording and a 5 MP front camera to satisfy your love for selfies. What do you think about this one-day open sale system by OnePlus? Is it gonna work in India? Will it help OnePlus steal the limelight from tomorrow's Xiaomi Mi4 launch in India? Feel free to sound off in the comments section. We are always listening.